Protect People and Equipment from Wind Through Prefab Shelters | BIG Enterprises Inc.
As you drive through town, there is a good chance that you have seen prefab shelters along the way without realizing what they are or how they benefit people. Also referred to as factory-built and pre-engineered shelters or enclosures, these standing structures work perfectly to protect people and equipment from the harsh elements. Prefab shelters can be designed specifically for your needs based on where you live and the type of protection you require. This type of shelter helps keep people and equipment out of the rain, snow, wind, and hot sun. If preferred, you can have your new shelter enhanced with things like way-finding signage, tinted or frosted glass, unique roof treatments, paint colors, and more. In addition to being customized to your exact specifications, once factory construction is complete, assembly requires no on-site labor. With a rugged design and construction of welded steel, a pre-engineered shelter is strong and durable. Once delivered to your location, usually a forklift is the only equipment needed to place it on top of a pre-poured concrete slab. After deciding on a prefab shelter, you can choose a basic design or have something elaborate created for you. The manufacturer can add various components to make the shelter more comfortable, including heat, lighting, cooling, and more. Even unique architectural features that complement the surrounding area can be incorporated into the design. A prefab shelter serves many purposes beyond protecting people and equipment. It can be installed in a lot with an automated parking machine. As a result, the tickets always come out dry. These shelters are also used by people who like taking smoke breaks. Today, smokers have limited options for taking outside breaks. With these shelters, they have a place to go that prevents smoke from drifting and offending nonsmokers. Prefab shelters are commonly placed along bus lines, as well. This provides people with a safe and comfortable place to sit or stand while waiting for public transportation. These shelters are also placed near train stations, giving people an alternative area to wait for departure. 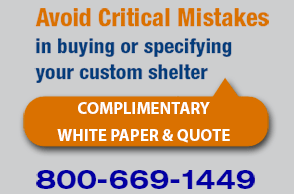 When looking at different options for prefab shelters, you want to work with a reputable manufacturer. A prime source is B.I.G. Enterprises, which has years of industry experience. When you are ready to have a shelter designed and constructed, this company will exceed your expectations.